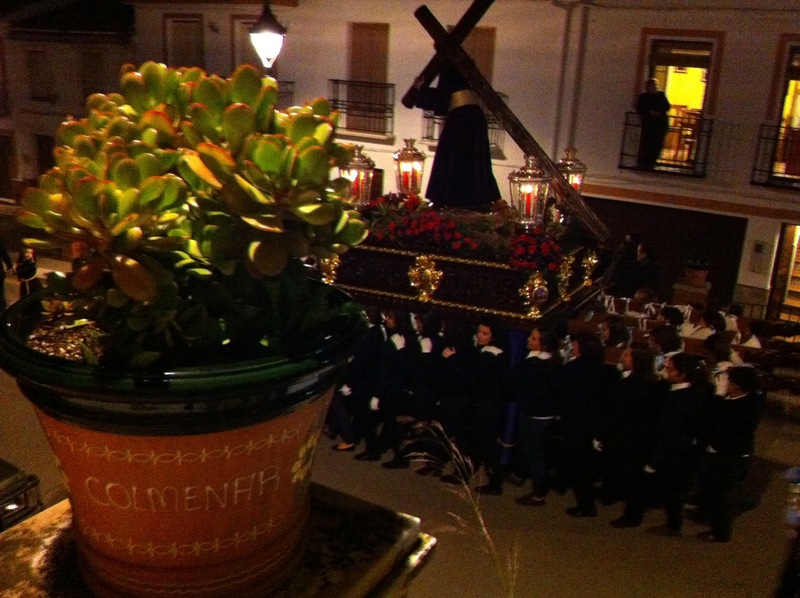 Changeable weather couldn’t keep the penitents, the celebrants, the Nazarenos or the tourists away from Semana Santa. In every city, town and village in Spain, people turned out to see the richly-decorated floats and the cofradías (brotherhoods) carrying them. 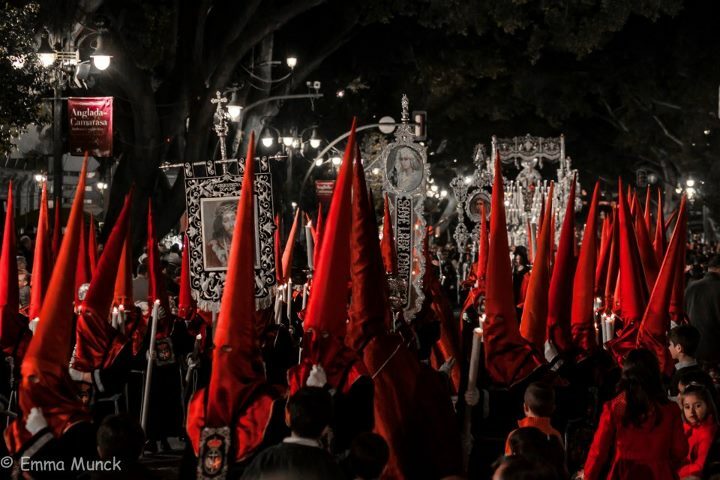 I have yet to find an area of Spain that does not genuinely believe that their Semana Santa is by far and away the best. Surely they can’t ALL be right? Well maybe they can. They’re all so different, yet they’re all the same. A full year of preparation, culminating in this most special of weeks and an outpouring of religious (and non-religious) fervour. People crossing themselves and sobbing at the sight of the floats, their long wait finally rewarded. 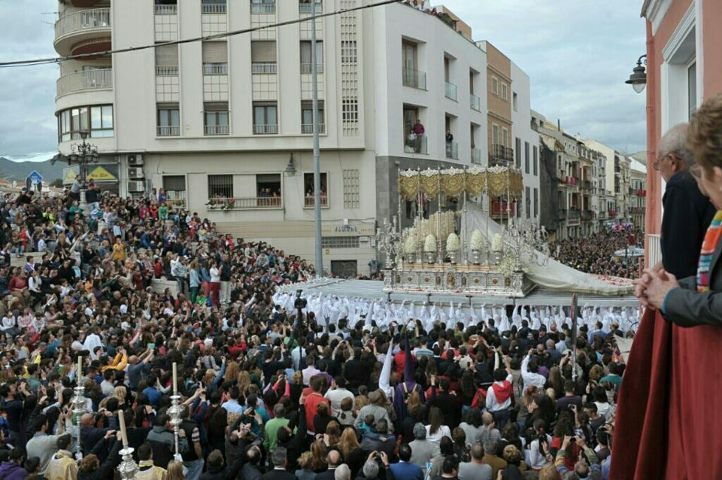 In the city of Málaga, the largest of the enormous tronos (floats) needs 400 men to carry it. La Virgen del Rocío with her long train is one of the most splendid, while live doves were released to accompany Las Palomas. Hundreds of thousands of people lined the streets, and every day brought out different tronos, each one a favourite for many people. Then in Colmenar Viernes Santo (Good Friday) dawned cloudy but dry. Villagers anxiously checked the sky throughout the day until it was time for the procession. All day a trickle of people filed past the two tronos in the cofradia headquarters. By 4pm the church was full for Mass. Then at 8pm the floats were ready to emerge. Silence fell outside as the huge doors were swung open and the band began its solemn march. The first float, Nuestro Padre Jesús Nazareno, followed, carried for the first time solely by women. 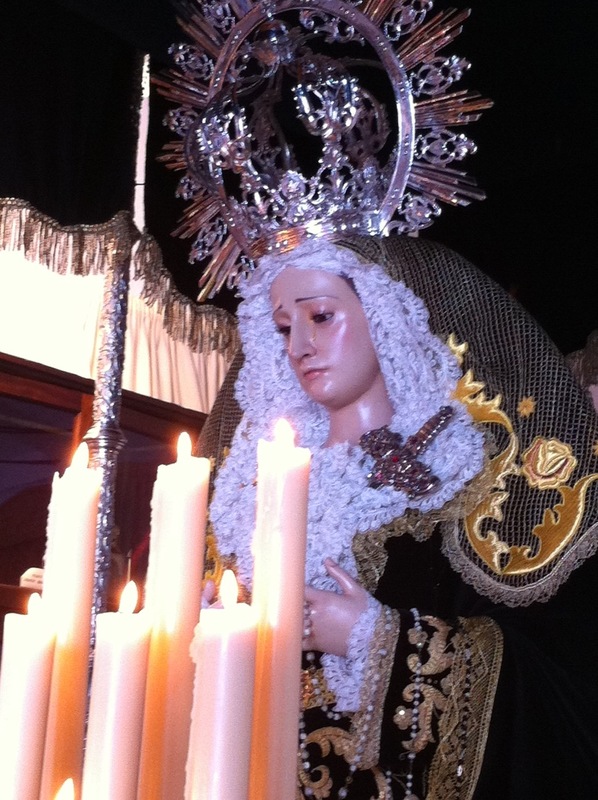 Behind, María Santisima de los Dolores emerged, carried by the men of the village. As the procession made its way around the village and up to the church, a reverent silence fell in the streets, broken only by scattered applause and some quiet sobs, almost drowned out by the solemn drumming. Four and a half long hours later the tired women and men returned the tronos to their resting place for another year. From high up here on the hill, we look down into the valley onto the neighbouring village of Riogordo. I tease my friends there, reminding them that we “look down on them” and that they “look up to Colmenar”. I’m not sure I can ever use that line again. 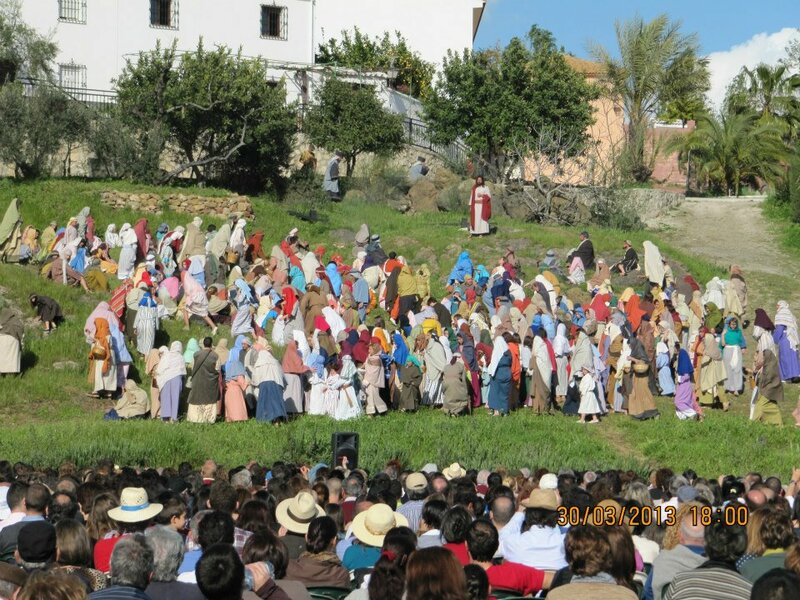 Because the most extraordinary experience of Semana Santa was watching “El Paso” in Riogordo, with 600 villagers taking part to act out the Easter story. How amazing for their village to put on such a huge dramatic event every year, and of such high quality. Taking over three hours, the story was acted out across a natural landscape of hillocks creating different areas for the scenes. The ex-stage manager in me couldn’t help but be impressed with Judas’ suicide (he fell dramatically, to hang from the tree apparently by his neck), and of course the crucifixion. The music was well-chosen and the central performances were given with passion, while the hundreds of “extras” took their roles seriously (though the occasional first-century villager did whip out an iPhone to grab a photo!). So perhaps everybody is right. For each city, town and village, their own traditional celebrations are the most important. 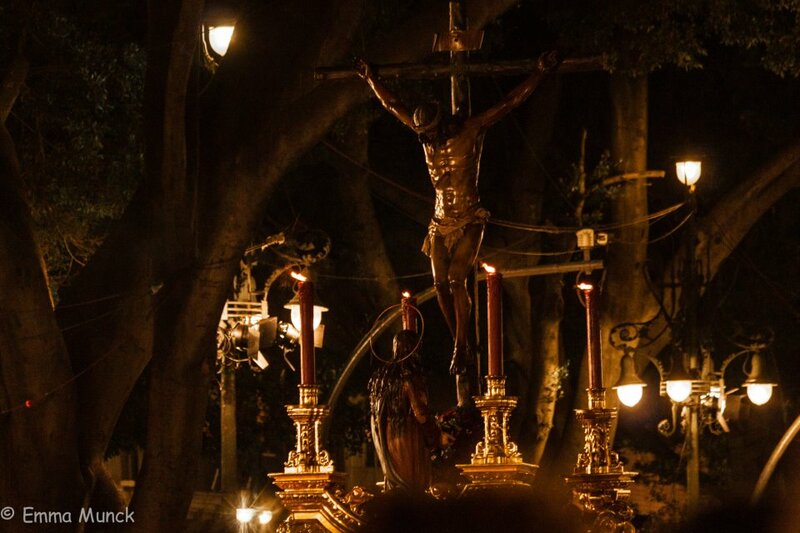 The Malagueños KNOW that their Semana Santa is the best in Spain. The village of Colmenar KNOWS that whilst theirs is not the biggest it is still the best. And little Riogordo, tucked away in its Axarquía valley, is safe in the knowledge that nobody can ever look down on it again. 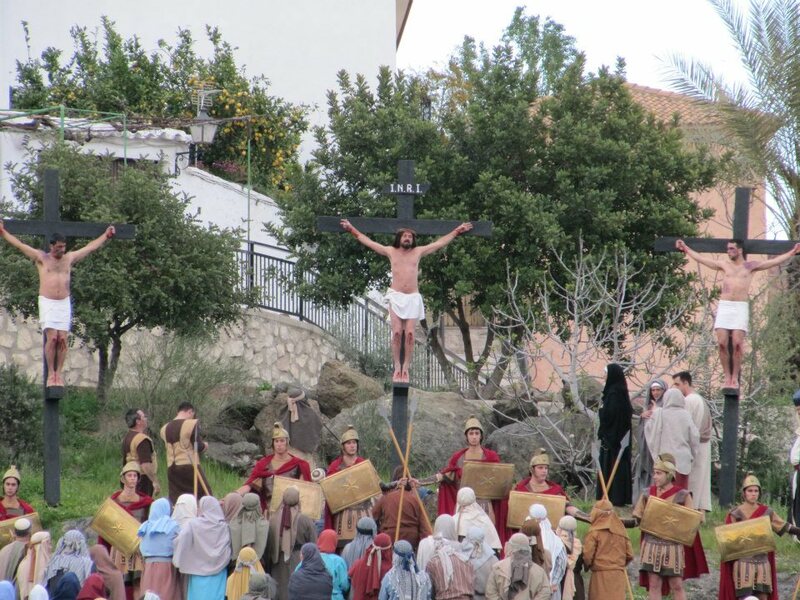 This entry was posted in Spain and tagged Andalucia, Axarquía, Colmenar, Málaga, Riogordo, Semana Santa, Spain, SpanishBlog, Tamara Essex by tamaraessex. Bookmark the permalink.